Beer is quite possibly the oldest beverage in the world, other than water of course. Some studies show that humans have been enjoying it since 9500 BC. It is popular worldwide, especially on the Korean peninsula. South Korea is the producer of the world’s most popular alcohol, Jinro Soju; it should come as no surprise that North Koreans share a similar spirit when it comes to alcohol. 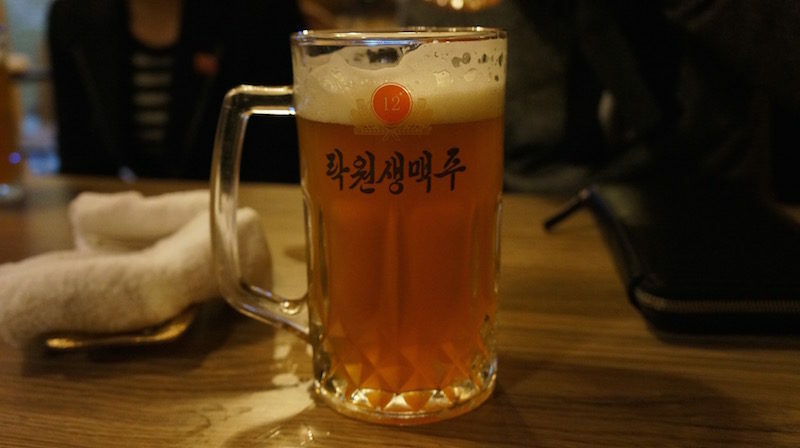 Many professional beer drinkers, better known as critics, even say the North does beer better than South Korea. Beer tourism is starting to boom in North Korea, with that comes the microbreweries. North Korea has enjoyed a constant flow of beer since the state purchased a German-made brewery in 2000. The hold this brewery has maintained on the domestic market is starting to be whittled away, and now microbreweries are starting to pop up all over the country. Microbreweries are becoming exponentially more popular throughout the entire world, and this trend proves true in North Korea as well. Pictured above is a selection of craft beer from the Taedonggang Microbrewery No. 2. Left to right, no 6, 5, 1. No 6 is a dark beer made of barley infused with coffee notes. No 5 is 100% pure white rice – big seller. No 1 is 100% barley. Alcohol content ranges from 4.5% to 6%. If bowling is your thing there is even a beer tank ready to serve you as you hit the lanes at the Golden Lanes Bowling Alley. 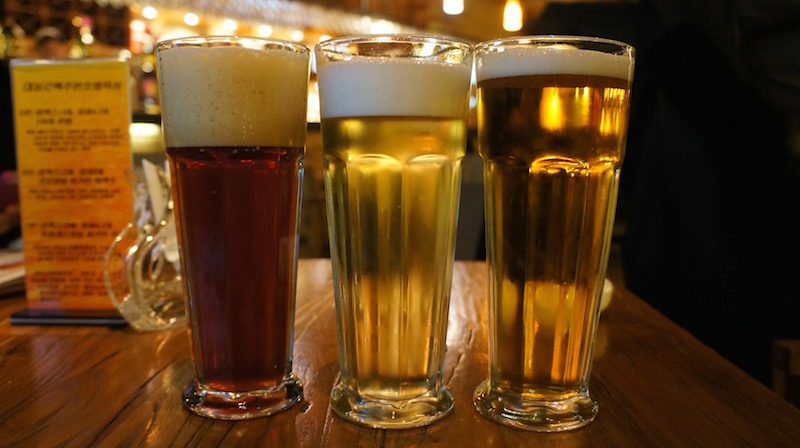 Or after a night’s rest, check out the Koryo Hotel Microbrewery, the Yanggakdo Hotel Microbrewery, and the Kumgang Hotel Microbrewery; these hotels brew their own since it is cheaper and more sustainable than reselling. There is a brewery for everyone, even one in the Haemaji Sunrise department store. And according to ratebeer.com, the Rakwon Paradise Brewery produces the country’s most popular beer, the Rakwon 12. Did we mention it is less than 1 USD? See photo below. If you want to get a taste of North Korean beer culture, any one of our North Korea tours will take you to our staff picks. From August 12th to September 1st, 2016, tourists booked on our tours (we’ll give you the option of attending at night) and locals will have the opportunity to attend the first ever Taedonggang Beer Festival as you coast along the Taedong River enjoying craft brew and of course our favorite bottled beer, the Taedonggang Beer (not to be confused with the microbrewery that is also called that). Enjoy the 7 renditions named number 1 through 7 while you coast toward the sunset and enjoy the view of Pyongyang. These beers are cheap too, starting at 0.50 USD to 2.50 USD for half a liter. Start at 19:00 at the promenade and put your feet back on land at midnight. The festival will start with an opening ceremony and a short speech and be followed by two short art performances later in the evening, and a chance to buy some souvenirs as well. Just enough time to try all 7 beers and mingle with the locals. Be the first to leave a comment for Microbrewing in North Korea – It’s Actually a Thing!